Hailey attorney Jennifer Haemmerle was selected Thursday as Blaine County’s new magistrate judge, replacing Judge R. Ted Israel, whose retirement becomes effective at the end of 2014. Haemmerle, 51, was selected for the position by the Fifth Judicial District Magistrates Commission early Thursday afternoon following interviews earlier that day of her and two other finalists, Twin Falls attorney Samuel Beus and Hailey attorney Ned Williamson. Fourteen members of the commission—13 men and one woman—attended the interview process, held in the district courtroom at the Blaine County judicial building in Hailey. Some 20 other people, most of who will work with Haemmerle on a daily basis, attended the meeting. Included in the audience were Judge Israel, several local attorneys, staff of the Blaine County Prosecuting Attorney’s Office, court clerks and probation office staff. “I think that my strongest attributes are going to be my head and my heart,” Haemmerle said. Questions from commission members included queries on public perception issues, alternatives to jail sentences, attitudes toward Hispanics and the possibility of gender bias. “I never remember being treated differently better, of differently worse, because of who I was,” Haemmerle said. Haemmerle presently is in private practice with her husband, Fritz Haemmerle, in the Hailey law firm of Haemmerle & Haemmerle, PLLC. Before that she worked for the Roark Law Firm from 1993-2001. Prior to that, she was an associate attorney with the firm of Roark, Donovan, Praggastis, Rivers & Phillips in Hailey and with the Elam, Burke & Boyd law firm in Boise. 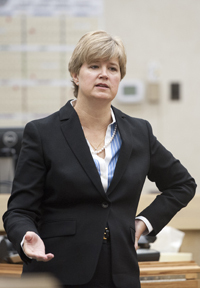 She has an undergraduate degree from the University of Idaho and a law degree from the UI College of Law. “This is my 26th year of practice and I’ve lived in Blaine County for 23 years,” Haemmerle said in an interview Thursday afternoon. “I consider this home. I love the diversity and I’m just really excited to be of service. As a judge, Haemmerle will be a state employee with an annual compensation, as provided for magistrate judges, of $112,000 plus state benefits. She was one of eight applicants for the position after Israel announced his retirement in March. In retirement, Israel will have “senior judge” status, meaning that he can be called to the bench to preside in special cases as needed. He served as Blaine County’s magistrate judge for 10 years, having previously served as a magistrate judge in Bannock County. As a magistrate judge, Haemmerle will handle both criminal and civil cases. On the criminal side, magistrate judges preside over nearly all misdemeanor crimes or traffic infractions and handle felony cases until they make a determination that there is sufficient evidence to transfer a case to the higher district court for further prosecution. On the civil side, magistrate judges primarily litigate financial disputes of less than $10,000 and family law, including divorces and child support and custody issues.